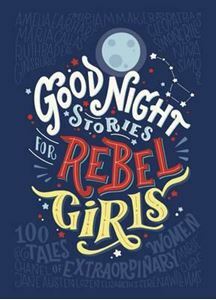 Vibrantly illustrated and truly inspirational, Good Night Stories for Rebel Girls tells the stories of 100 heroic women from Elizabeth I to Serena Williams. Vibrantly illustrated and truly inspirational, Good Night Stories for Rebel Girls tells the stories of 100 heroic women from Elizabeth I to Serena Williams What if the princess didn't marry Prince Charming but instead went on to be an astronaut? What if the jealous step sisters were supportive and kind? And what if the queen was the one really in charge of the kingdom? Illustrated by sixty female artists from every corner of the globe, Good Night Stories for Rebel Girls introduces us to one hundred remarkable women and their extraordinary lives, from Ada Lovelace to Malala, Amelia Earhart to Michelle Obama. Empowering, moving and inspirational, these are true fairy tales for heroines who definitely don't need rescuing. Our differences are our richness, but also our problem... We have often wondered whether there is anything Quakers today can say as one.